Running a 5K PR one week post-marathon is taunting the gods of injury. I should know...doing just that in this same race is exactly how I injured myself one year ago. The advisable thing to do one week after running a marathon is to rest and recover, maybe log some easy runs. The problem is, I seem to be incapable of holding myself back once I toe the starting line of a race. The Freedom Run is the second 5K race in the four-part Cambridge 5K race series, which just so happens to be my favorite race series in all the land. Skipping this race was out of the question! So, one week after a hard fought but short-of-the-mark effort at the Vermont City Marathon, I returned to the familiar roads of Cambridge to run like a bat out of hell. I don't recall making a conscious effort to do so, but the foolish and prideful parts down in the depths of me ran this race for redemption. 13 seconds faster than I've ever officially run a 5K before. 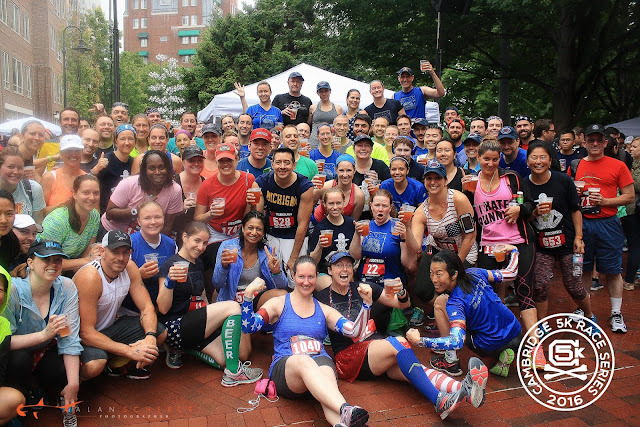 This patriotic themed race is hosted by the East Cambridge Business Association and sponsored by Cambridgeside. The race course starts and finishes outside the Cambridgeside Galleria in East Cambridge. It's a flat and very fast loop course with just 5 easy turns that takes runners through East Cambridge to Inman Square and back. As are all races in the C5K race series, it was impeccably organized and ridiculously fun. This year, there were 1818 runners. 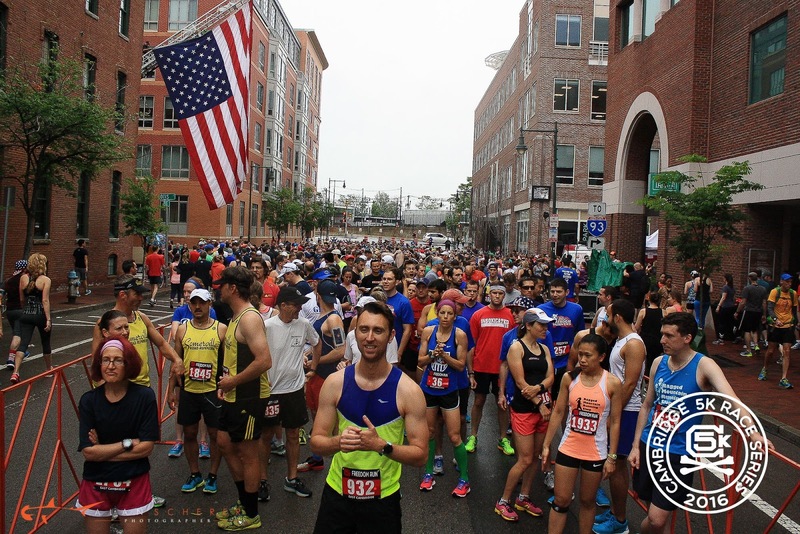 Having cooked my insides in the sun of Vermont one week earlier, I was pleased to wake up on the morning of the race in Cambridge to cool, gray skies and a touch of misty June gloom. 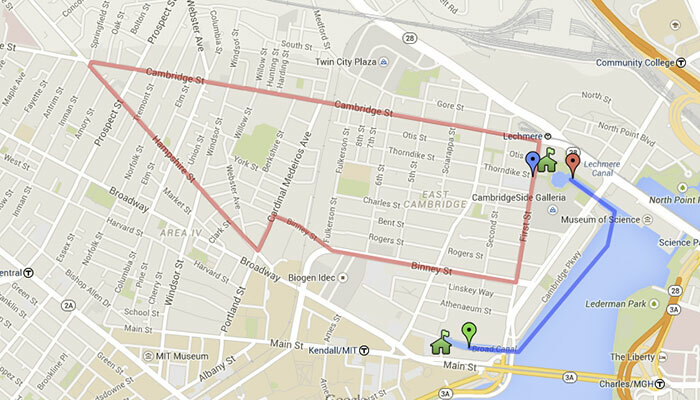 I was also thrilled to run on the very Cambridge streets I run on almost every day. Chris joined me for this race and we jogged the one mile from our apartment to the start line together. I got my 21+ wristband, checked my backpack, said a few hellos, and huddled into the corral. I looked a little nervous, no? No matter how many races I run and how nonchalant I pretend to be about the whole thing, I still feel exactly the way I look in this picture every time I line up in the starting corral. Every time. Ready, set, go! A sharp horn at 9:30 on the dot, and my legs started to do their thing independently of my brain. Go legs! Right turn on Binney Street. First mile timer in view at the end of Binney read 5:14. At the left turn on Cardinal Medeiros, I quickly confirmed with my watch that this clock was started one minute after the actual gun time. I don't believe I've ever run a 5:14 mile in my life, or will. Ever. Quick right onto Hampshire Street. Waved to my apartment. Settled in, feeling pretty groovy. Heard someone yelling my name! Sharp right on Cambridge Street. There was Ciara, cheering wildly! I grinned and yelled back. Mile 2 clock, also one minute off from gun time, read 11:54. Knew I was slowing a bit, but that's how this course works for me. Downhill to start, flattish second mile. And the third mile? There's this gradual, gentle climb from Petsi Pies to Courtside Tavern on Cambridge Street that, during any normal run, is hardly noticeable as a hill. At mile 2.5 of a 3.1 mile race, it feels endless! The familiarity of running in my own 'hood came in handy here. Having prepared for slowdown and hard effort in this mile, I passed a handful of runners laboring up the hill. Reached the crest of the hill, looking down. Close enough to hit the gas, but not yet close enough to run flat out. Final right turn onto First Street. With glimpse of the finish line, I gritted my teeth and let it fly in the last hundred yards, passing three men and one woman. The end result of my foolishness? 20:21 net finish, a Personal Record by 13 seconds. 77th place overall of 1818 runners. I cheered as Becca, Dave and Chris made strong finishes, then sauntered over to the post race party. Feeling smug about my accomplishment and inspired by the camaraderie of the Slumbrew Happy Soles, I rewarded myself by drinking one too many pre-noon beers. What a good looking group of Happy Soles!